Jason Allen of Barre ran down pole-sitter David Whitcomb of Essex Jct. halfway through the race and stayed on top the rest of the way to claim victory in the Thunder Road Late Models on Jet Service Envelope/Accura Printing Night on the final Thursday night event of the season. Allen started fifth in the 24-car main event field, moved into second on the eighth lap, and erased Whitcomb’s 15-car length lead grab first place on the 24th lap. Whitcomb couldn’t catch back up to Allen, but was able to maintain his position and finished the caution-free race in second place. The victory was Allen’s first of the season, and the second of his Late Model career at Thunder Road. Marcel Gravel of Wolcott finished in third place. Tyler Cahoon of Danville, who won his heat and semi-feature and would have earned a $1300 bonus from Maplewood for the Triple Crown with a feature victory, was fourth. Cody Blake of Barre finished fifth, and was followed in the top 10 by Kyle Pembroke of Montpelier, Matt White of Northfield, Nick Sweet of Barre, Scott Dragon of Milton, and Jason Corliss of Barre. Brendan Moodie of Wolcott followed up a win in the opening segment with second and sixth place finishes in the second and third segments to claim the overall victory in the Bond Auto Tiger Sportsmen Triple 20’s. Moodie finished with a combined nine points over the three races to finish two points ahead of second-segment winner Mike Martin of Craftsbury Common. Rounding out the top five were Stephen Donahue of Graniteville, Cameron Ouellette of Barre, and Mark Barnier of Essex Jct. Tommy Smith of Williamstown won the third segment. In the Allen Lumber Street Stocks, Jaden Perry of Hardwick earned his first victory of the season after passing rookie Cooper Bouchard of Hinesburg for the lead on the final lap. Bouchard, looking for his second feature win of the season, settled for second in the 23-car field. Jamon Perry of Hardwick finished third. He was followed in the top 10 by Thomas Merchant of Eden Mills, Brandon Lanphear of Morrisville, Alan Maynard of Fairfax, Kelly Miller, Jr. of Johnson, Garry Bashaw of Lincoln, Reilly Lanphear of Duxbury, and Greg Collette of Milton. 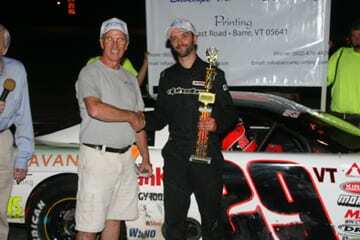 Greg Donahue of Barre and Dwayne Fuller of Starksboro were winners in the annual “Run-What-U-Brung” event, where race fans risk their own cars in match races against each other on the quarter-mile oval. Racing action returns to Thunder Road on Sunday, September 4 for the 38th Coca-Cola Labor Day Classic. The event features a full card of action for the Thunder Road Late Models, Bond Auto Tiger Sportsmen, and Allen Lumber Street Stocks. Post time is 1 p.m. Admission is $25 for adults. Kids 12 and under are free.